September has always been one of my favorite months. I love the cooler weather and the feeling of order and productivity that a new schedule brings. We are in full swing with school, soccer and music lessons. 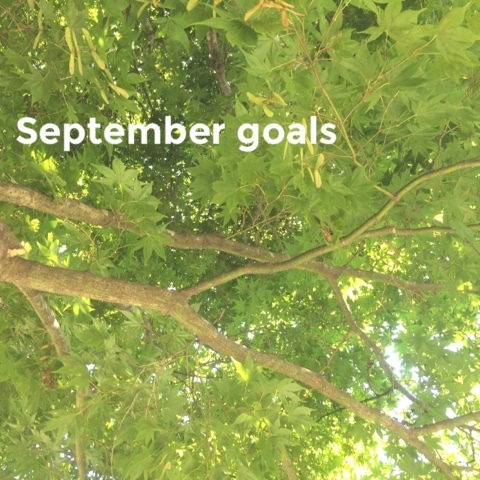 Each month I share some goals for the month ahead along with some other bloggers. Here's what happened last month. 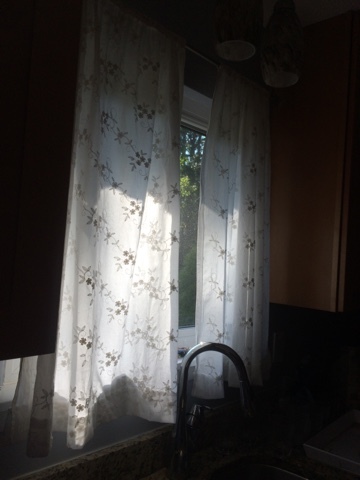 I am so pleased with how these curtains complete my kitchen. They were over the doors, but we went with blinds inside the panes there. So, I hemmed them to use in the kitchen. I especially love having the warm privacy at night instead of the darkness invading. It's perfect with shorter days of fall coming. I organized my preschool science posts. Not my entire goal, but better than nothing. This week I spent some time contemplating what I would like to change for my kids. Picture my hands frantically emptying the dish washer as I contemplated. The answer: undo my perfectionism. Perfectionism is a curse I don't want to hand down, but I am. My September goal, develop some action points. I am continuing with my strategy of no new projects until my list is done (Described in my August goals). I really would love to start 2017 with a clean slate! I am going to finish organizing kid science posts and hope to get kids math done as well. We'll see. I think perfectionism holds all of us back in some way or another.